College athletes make their first attempt to enter the NFL with the beginning of the Scouting Combine, a skills showcase created to measure the readiness of each player at they make their transition to the pros, as well as to give NFL executives and coaches the opportunity to see these young men first hand, to obtain a sense of their worth as the NFL Draft quickly approaches. The Combine is an important time for these young players, a time to show their skills, to interview well, to compete against others at the same positions, to raise their Draft stock as high as it can go. Let’s take a look at some early results that general managers and coaches might be taking a look at as they decide who to select to their respective teams. 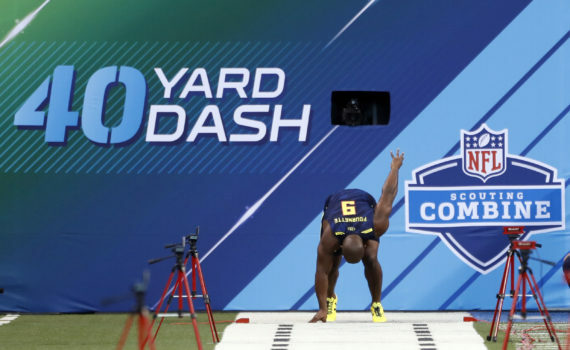 John Ross blew the competition away at the 40 Yard Dash at the Combine, setting the record for the fastest ever recorded score. College football is one thing, but to be able to show that impressive speed off in front of executives who have your career in their hands and a stop watch that may decide your professional fate, well that’s another thing all together. Ross impressed, and odds are many NFL teams will be clambering for his speed come Draft day. Ohio State’s Curtis Samuel was impressive as well, and should be a top receiver selected very soon. More competitions are under way right now, more displays of skills, as college athletes prepare for the big jump to the big leagues, so keep an eye on the results, and we’ll see what your favorite team does with these talented young players heading into the 2017 NFL season.